The coin was struck at the Czech Mint, having a mintage of 1000 pieces. 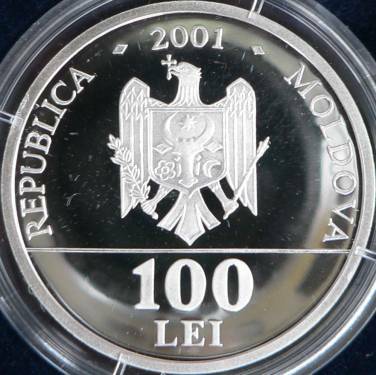 The Republic of Moldavia struck coins also for the 5th anniversary, for the 15th anniversary and for the 20th anniversary of the proclamation of the independence. 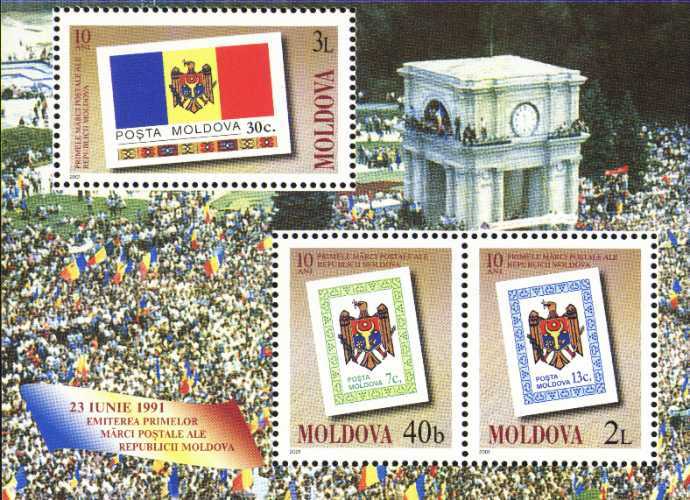 On August 27th 1991 the Parliament has proclaimed the Independence of the Republic of Moldavia and so the breaking off from the Soviet Union, giving juridical form to the decision of the Great National Gathering that took place the same day in Chişinău. Also on August 27th, but in 1989, the first Great National Gathering of the Romanians in Basarabia had taken place in Chişinău, an important milestone in the fight for shaking off the Soviet occupation. 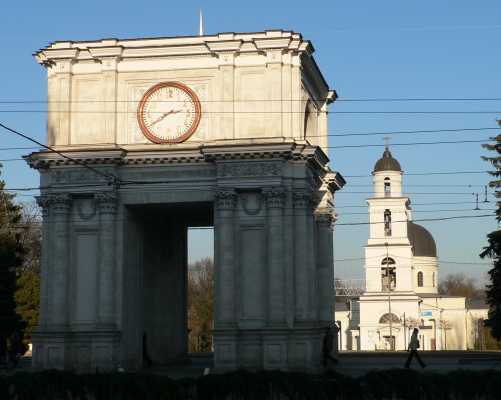 On August 27th 1990 the statue of Stephen the Great and the Holy had also been sanctified in Chişinău. 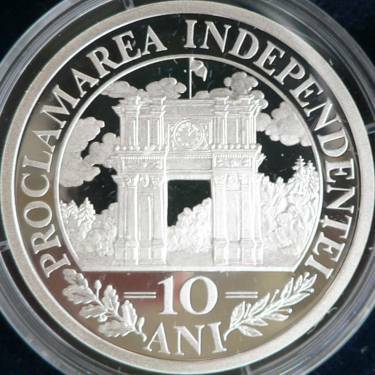 The Great National Gathering took place on the Stephen the Great and the Holy boulevard in Chişinău, in front of the Government building, facing on the other side the Holy Gates (represented on the coin), at the entrence of the central park with the Gavriil Bănulescu Bodoni cathedral amid it. On the top of the arch the Romanian flag was waving (not bearing any differentiation yet). Click here to listen to one of the speeches of Mr Mircea Snegur, the president of the Republic of Moldavia at the time. The speech, in mp3 format (~200 kb), can be downloaded by right-clicking and choosing the option "Save Target As". Just like in 1918, in the case of the Democratic Moldavian Republic, the sovereign state condition was seen as an intermediate step before the Union with Romania. At the Great National Gathering the crowd shouted out "Unire! ", meaning "Union!". Click here to listen to a fragment of the great poet and patriot Grigore Vieru's speech, interrupted by ovations for the Union. The speech, in mp3 format(~500 kb), can be downloaded by right-clicking and choosing the option "Save Target As". In the old times the Holy Gates were called the Triumphal Arch or the Victory's Arch. The monument was built in 1841 by architect Luca Zauşchevici. 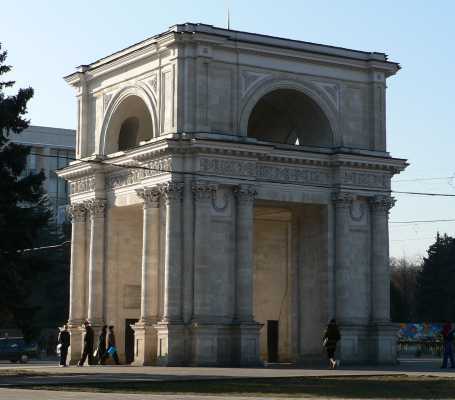 It has a square plan, 13 meters in height, being built in white stone, in Russian empire style. It was errected to celebrate the Russian armies' victory against the Turks. The belfry and cathedral were built between 1830 and 1836.